Cheesecake Danish Recipe - Let the Baking Begin! 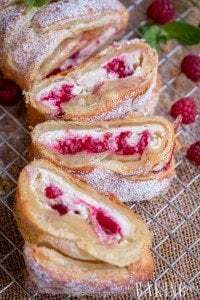 Cheesecake Danish is a puff pastry dessert that’s filled with sweet cheesecake filling and drizzled with Lemon Sugar Glaze. Make it once and your family will ask you to make it time and time again. Ready in 30 minutes or less! Having frozen puff pastry on hand means that you’re ready to make dessert anytime. 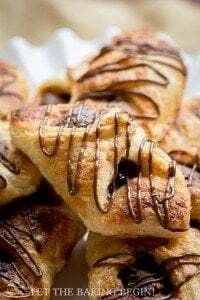 Variations of fillings are limitless since they can be filled with pretty much anything – from fresh fruit to Nutella, to cheese, to jam you probably have at least one of these to make delicious danishes. The Cheesecake Danish are especially good for potlucks, or large parties since they come together very quickly. We have made them several times for church fundraisers and potlucks. Buying puff pastry from restaurant depot type of stores means that you get a lot of puff pastry dough for a really good price. We usually split the large pack between my sister and mom. For this recipe, I used farmer’s cheese (which you can make at home using THIS or THIS recipe), but you can use rinsed out Cottage Cheese curds, Ricotta Cheese or even cream cheese. If using rinsed out curds of Cottage Cheese make sure to use a paper towel to blot out any excess moisture. Cheesecake Danish is a puff pastry dessert that's filled with sweet cheesecake filling and drizzled with Lemon Sugar Glaze. Make it once and your family will ask you to make it time and time again. Ready in 30 minutes or less! Remove puff pastry from freezer and allow to thaw slightly. Turn oven to 400F. Line baking sheet with parchment paper. While puff pastry is thawing, make the filling, glaze & egg wash.
Make sure fresh/farmer’s cheese is very well drained. If it is not, press a paper towel against the cheese to remove any additional moisture. Combine cheese, sugar, egg, flour, vanilla extract and mix together. Make the eggwash: Beat 1 egg, set aside. Cut each puff pastry sheet into 9 squares and place 1 heaping teaspoon of cheesecake filling in the middle of each square. Pinch two opposite ends of the pastry together, by overlapping them and pressing firmly together with your finger. 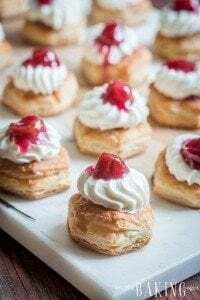 To prevent the filling from spreading too much, freeze the pastries for at least an hour before baking. If time does not allow for this, proceed to next step. 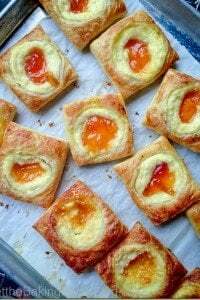 Brush pastries with the egg wash and lightly sprinkle with sugar. Place in the oven and bake for 15 minutes or until slightly golden. 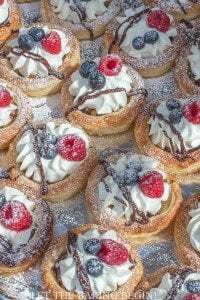 If pastries were previously frozen, do not thaw them, but put in the oven directly from the freezer and adjust baking time accordingly. Remove from the oven and allow to cool. Stir powdered sugar, lemon juice & water until smooth glaze forms. Transfer to a ziplock bag. Snip off the end. Drizzle on top of pastries by going in a zig-zag pattern. Allow the drizzle to firm up before stacking pastries. *Thicken the glaze by adding more powdered sugar or thin it by adding water one drop at a time. Best when eaten within 1-2 hours of baking. Can I use cream cheese instead of fresh cheese for this recipe? These look delicious! I am allergic to milk & milk products, I have some cream cheese flavoring, do you have any idea what kind of non milk filling could be added instead? Would a fruit filling be acceptable? Thanks. What were you looking for in particular? 1/2 cup of fresh cheese, is this ricotta? Thanks. Fresh cheese is like farmers cheese, curd cheese or cottage cheese. Ricotta does not have the tang that those other types have, but if you do not have the other kind, you could substitute it with ricotta. Thanks, I’ll be making these this weekend!